I wrote a short post about moving Sophie from her cot to a toddler bed at the beginning of the year. However, I thought it was about time I updated you and gave you some tips, which may help if you are thinking about making the transition yourselves. We originally wanted to keep Sophie in her cot for as long as possible. We thought around two years old would be the ideal age to convert her cot into a toddler bed as she would understand the change a bit better. However, Sophie had other ideas and when she was 19 months old she managed to throw herself out of her cot one night (when she was supposed to be sleeping!). Toby and I heard a loud bang and we instantly ran upstairs to the sound of Sophie screaming. Luckily, she wasn't hurt and after plenty of cuddles etc. she went back to bed no problem. I knew Sophie had a shock and probably wouldn't to it again, but it wasn't worth the risk. If she managed to climb out again and injure herself - I would never forgive myself. So, that night, I went online looking for a bed guard and chose the wooden BabyDan bed rail as it's white and matches her cot. 1. Don't rush it - but, in our case, it was the safest option. 2. Make sure furniture is attached to the wall and items that they aren't supposed to play with are out of reach (baby monitors for example). 3. Put a baby gate on their door so they can't wander around the house. 4. Leave a few books and toys in the room, so they can entertain themselves for a bit in the morning (hopefully not in the middle of the night haha). 5. Don't worry about it, we thought it would be a nightmare but it really wasn't that bad.. you just have to be patient as it's a big change. I hope you found this post hopeful. 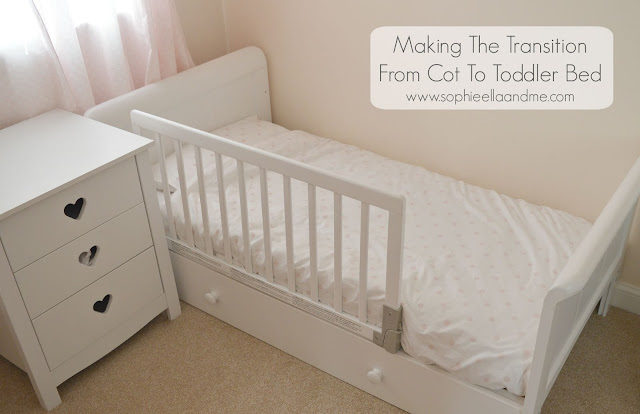 What age did you transition from cot to bed? How did you find it? Let me know!